Sea kayaking is our favourite way to experience these two pieces of paradise—in Newfoundland and British Columbia. Paddling to Lark Harbour, Newfoundland with Guernsey Island in the background. With over 17,000 km of beaches, sea stacks and bold rocky cliffs, you could paddle along a different shoreline of Newfoundland every summer and still never see it all. 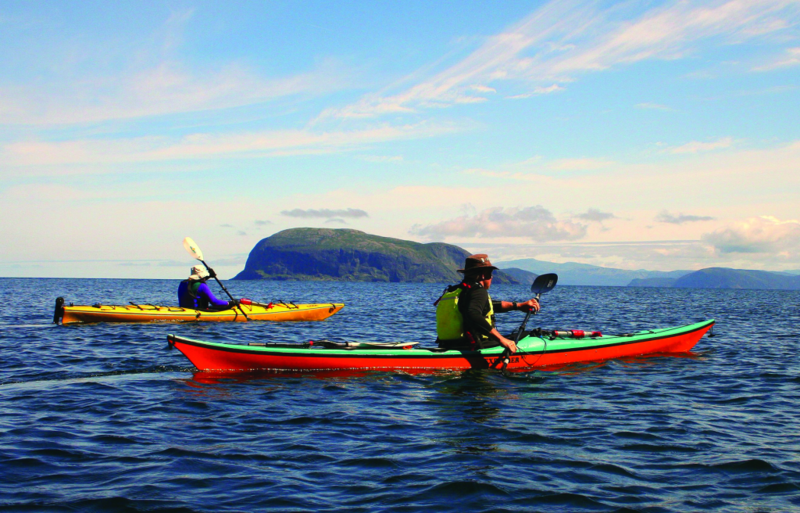 One area that provides a huge variety of paddling opportunities is the Bay of Islands, near Corner Brook on the province’s rugged West Coast. Over the years we have explored this area many times. Depending on the weather, you can choose to paddle past monstrous 300 to 400 meter cliffs or to numerous offshore islands complete with sandy beaches and great camping spots. For light wind days, a favourite paddle is to circumnavigate South Head Lighthouse. 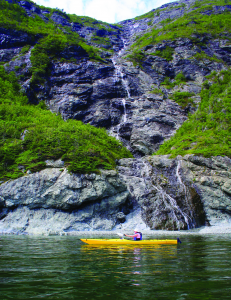 Paddling past a waterfall en route from Bottle Cove to Lark Harbour. We usually drop in at the sandy beach in Bottle Cove, at the end of Highway 450, and then head out into the open Gulf of St. Lawrence. Offshore we can see glacially sculpted Guernsey Island, one of the islands that stands guard to the entrance of the Bay of Islands. There are few pullouts along this first 6-km stretch, so best to attempt this trip only when the swell and winds are light. Once you round South Head Light, the wind and waves usually drop and there are several beaches on which to have lunch. At high tide you can even paddle through an elegant sea arch. The total trip of about 13 km can easily be done in less than four hours. On the lookout for eagles off the coast of British Columbia. For less experienced paddlers, I suggest trips near Corner Brook along the shore. A popular trip here is the 5-km (one-way) paddle from Mt. Moriah to Cooks Brook. Keep your eyes peeled for whales and osprey since they often visit this area. A few years ago we had the opportunity to kayak on the other West Coast when we sampled paddling on Vancouver Island. Our first stop was Schooner Cove Resort, located right on the ocean. We paddled to the Ada Islands just offshore and were treated to views of harbour seals and a vibrant intertidal world full of bright starfish and other marine inhabitants. We even saw an avalanche of more than a dozen seals slide into the water as we approached their haul-out rock. We were in eagle heaven on our sea kayak trip near Courtney, BC. The next day we traveled north to the community of Courtney. 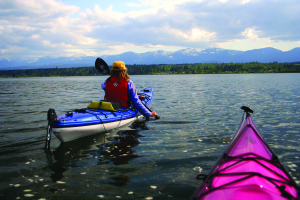 There we paddled with Comox Valley Kayaks along a protected shoreline. Seals popped their heads out of the water and we were in eagle heaven, watching as these huge birds cruised the shoreline for food. 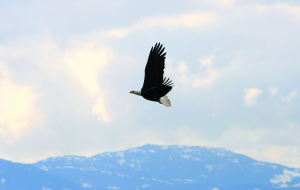 Several of them swooped directly over-head and one eagle even let us approach to within a few metres. My final takeaway: Sea kayaking is a perfect way to enjoy our natural world, no matter which coast you live on.